In an otherwise hot and sparse environment, palm oases provide the luxury of shade and coolness. The oases require a constant supply of water, so they will occur along fault lines where hard rock forces water from underground to the surface. 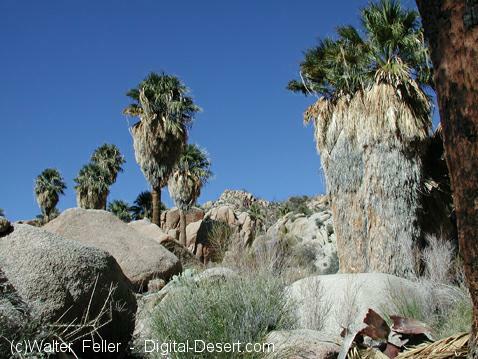 There are 158 desert fan palm oases in North America. Five are located in Joshua Tree National Park. 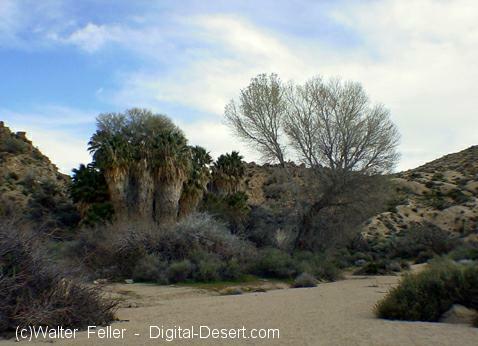 Washington filifera, the desert fan palm, is a native to the low hot deserts of California. They can live for 80 or 90 years and grow up to 75 feet tall. They are definately the heaviest, with a mature palm weighing up to three tons. Its leaves are folded and shaped like a fan. They can grow up to nearly six feet in length and width. When the leaves die they remain attached to the trunk until removed by wind, fire or flood. People have been using palm oases since prehistoric times. Native Americans, such as the Serrano and Cahuilla would set fire to the oases to increase fruit production and remove the sharp-edged fronds from the desert floor. They would use the broad leaves for waterproof shelters and ate the fruit. They would also propogate oases by planting seeds in locations that looked promising. Desert fan palms have to have water available to them. They absorb water using a system with pencil-sized rootlets so dense other plants cannot penetrate. These rootlets spread about 20 feet from the tree in all directions. However, these rootlets are subject to washing away easily in flash floods. Fan palm trees living in narrow canyons will typically die from flash floods. 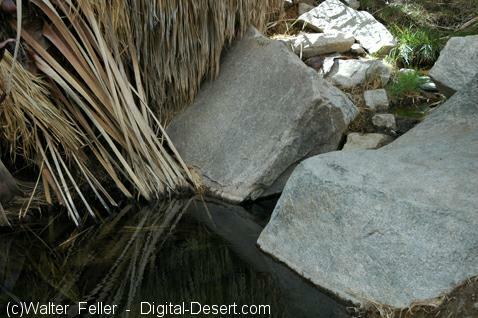 The surface water at an oasis will attract animals such as bighorn sheep, Gambel's quail, and coyotes. Coyotes will eat the fruit and deposit the undigested seeds in other areas, if there is enough water they will grow. Western yellow bat will only live in fan palm trees. Barn owls will also make their home in the giant leaves. Hooded oriole may also make thier woven sack nests under the leaves. Holes in the tree trunk are made by the blue-black, giant palm-boring beetle, Dinapate wrightii. These beetles live exclusively in fan palms. Palms stand straight, tall and look beautiful providing a unique and welcome area for many different kinds of animals. They are fragile though, and deserve our respect when exploring them.